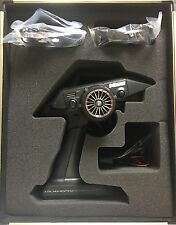 radio control hal 2100 auto levelling system, with a sanwa RX 831 receiver. 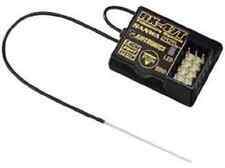 radio control hal 2100 auto levelling system, with a sanwa RX 831 receiver. . Condition is Used. Dispatched with Royal Mail 1st Class. Condition is Used. RX482 receiver in box. Sanwa STAC-4 Digital Proportional Radio Control System. Condition is Used. Dispatched with Royal Mail 1st Class. Vintage Sanwa transmitter. Good working condition. Box is tatty. Any questions please contact me. SANWA VG-400 Radio with Servos, Receiver, Battery and Charger Complete. All working ready to use. Combined with Airtronics or Sanwa Super Response SRG digital servos, the RX-482 Super Response SSL receiver will give you reaction speeds like never experienced before! When used with an Airtronics or Sanwa M12S, M12, MT-4S or Sanwa EXZES-Z transmitter and a Super Vortex series ESC or other SSL compatible device, the SSL function allows you to change many programming mode options directly from the transmitter using the transmitter's CODE AUX function, on the fly - even while you're driving. ProTek RC Radio case insert for M12/M12S/M12-RS. Sanwa RX-482 Telemetry/SSL Receiver #SA107A41257A. Condition is New. Dispatched with Royal Mail Signed For® 2nd Class. 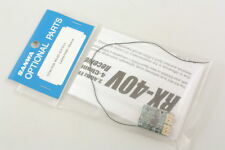 Compatible radio - For SANWA 2.4Ghz surface radio system. RX-371WP FHSS-2 Waterproof Receiver. Waterproofing: Waterproof. UK - Northern Scotland, Highlands, Islands £3.50. UK - Northern Ireland £3.50. UK - Northern Scotland, Highlands, Islands £3.50. UK - Northern Ireland £3.50. UK - Isle of Man, Isle of Wight £3.50. Channel Islands £4.50. Comnpatible with MX-6. Up for sale is a vintage Sanwa receiver. 2 Channel. 27MHz, AM. Model: SRC-2322RS Tested and fully working. Good, used condition. Suitable for many radio controlled brands, like Tamiya, Futaba, Hitec, Acoms and many more... Sold as seen. Any questions please ask. Postage to the UK is free. I also post overseas. Check out my other items for sale for more vintage and modern radio controlled parts! Thanks for looking. YOU ARE BUYING A PAIR OF SANWA CHANNEL 67 TX AND RX CRYSTALS ON 35MHZ. Compatible radio - M12S, M12, EXZES ZZ, EXZES Z, M11X, EXZES X, MT-4S, MT-4, MT-S, MX-3X, GEMINI X. UK - Northern Scotland, Highlands, Islands £3.50. UK - Northern Ireland £3.50. UK - Isle of Man, Isle of Wight £3.50. Sanwa EXZES ZZ Radio Set. --RECEIVER: RX472. [SSL(SANWA Synchronized Link) Sysytem]. SANWA NEW SSL SYSTEM. --TRANSMITTER: TX-452. --When used with compatible RX-472, RX-482, Super Vortex Series, SV-Plus Series, the setting of ESC etc. by Transmitter is available through SSL functions while driving. Sanwa Synchronized Link ( SSL ) function support. Sanwa Super Response (SSR) support. SSL Function (Sanwa Synchronaized Link) System From using both of "RX-472" and "Super Vortex Zero", Drivers operate. These are a matching pair- one for the transmitter and one for the receiver. Sold as seen. 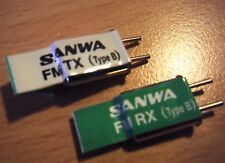 YOU ARE BUYING A PAIR OF SANWA CHANNEL 85 TX AND RX CRYSTALS ON 35MHZ. ●2.4 GHz FHSS5 Spread Spectrum System 4ch. Plug in Bind. 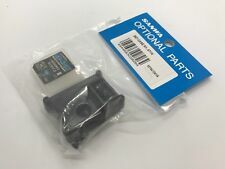 ※Cannot connect RPM sensor and Temperature sensor. combine with SUPER VORTEX series. ●Compatible with SSL (SUPER VORTEX Series, etc. ). ●2.4GHz FH-E 3ch (SPREAD SPECTRUM COMMUNICATION SYSTEM). Channel : 3ch. ●2.4GHz FHSS4/FHSS3 Spread spectrum system 4ch ●Sanwa Super Response (SSR) support. ●Lightest receiver in class. 6.6g Compatible radio. The RX-481 Super Response receiver is compatible with Airtronics and Sanwa 2.4GHz FH3 and FH4T transmitters, such as the M12S, M12, MT-4S, MT-4, MX-3X, M11X, EXZES-Z and Gemini X. Compatible with Sanwa and Sanwa FH3 and FH4T Transmitters. Has blue option rubber kit. ●Sanwa Super Response (SSR) support. ●Water proof (IPX4 spec). ●2.4GHz FHSS4/FHSS3 Spread spectrum system 4ch. Channel : 4ch. RX71E 7-Channel 2.4GHz FHSS-1 Receiver (1 pc). Aquila 6 6-Channel 2.4GHz FHSS-1 Transmitter (1 pc). 6 Cell Dry-Cell Transmitter Battery Holder (1pc). On/Off Switch (1 pc). Weight: 48 g. Motor: 17T. ●2.4GHz FHSS4 Spread Spectrum System 4CH. Frequency : 2.4GHz FHSS4. Channel : 4CH. Compatible radio : M12S, M12, EXZES ZZ, EXZES Z, MT-4S, MT-4(non-Compatible with SSL), MT-S.
Sanwa MT-44 Radio system with Two Receiver RX-482 & RX-472. Sanwa MT-44 Radio System. ■SYSTEM: 2.4GHz FH4T/FH3 ■4CH ■Transmitter: TX-471 ■Receiver: RX-482/RX-451. ●Compatible Receivers ・4WS MIXING (Front/Rear/Normal(coordinate phase)/Reverse(opposite phase)). ■Ultra Response Mode (SUR) New Transmitter system "FH5" makes new record of the World Fastest Response. ■Steering Unit can change position for lefty. Newest firmware is Ver.1.01.05. ■Installed Multi-Setting Function is available to set PGS servos to connect with transmitter. MPN 107A40834A. It is understood only as shown in the pictures. There is no hand-pick the goods. Sanwa MT-44 Radio system with Two Receiver RX-482 & RX-451. Sanwa MT-44 Radio System. ■SYSTEM: 2.4GHz FH4T/FH3 ■4CH ■Transmitter: TX-471 ■Receiver: RX-482/RX-451. ●Compatible Receivers ・4WS MIXING (Front/Rear/Normal(coordinate phase)/Reverse(opposite phase)). Sanwa / Airtronics Piano Black MT-S 4 Chan. 2.4Ghz Transmitter W/ 2 Receivers. SANWA RX-381 receiver 2.4 GHz FH3, FHSS technology, 3 channels 107A41073A No. 107A41073A •. 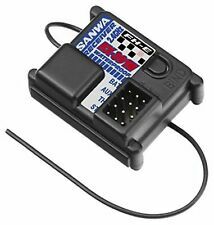 SANWA RX-381 receiver 2.4 GHz FH3, FHSS technology, 3 channels. The Sanwa RX-381 2.4 GHz FH-3 is a universal the Sanwa-3 channel 2.4 GHz transmitter M11X, MT-4, MT-4 S, MX-3 X and Exzes X.
Radiocomando Sanwa MX-V 3-Channel 2.4GHz F.H.S.S.-2 Surface Radio System (A1770). No R/C racer needs more! The Sanwa MX-V works with the Sanwa F.H.S.S.-2 2.4GHz technology. In addition, the Sanwa MX-V is compatible with different receivers.